Southern Italy – what can I say? It’s breathtaking. It’s delicious. It’s historic. And I was lucky enough to spend the month of October there. 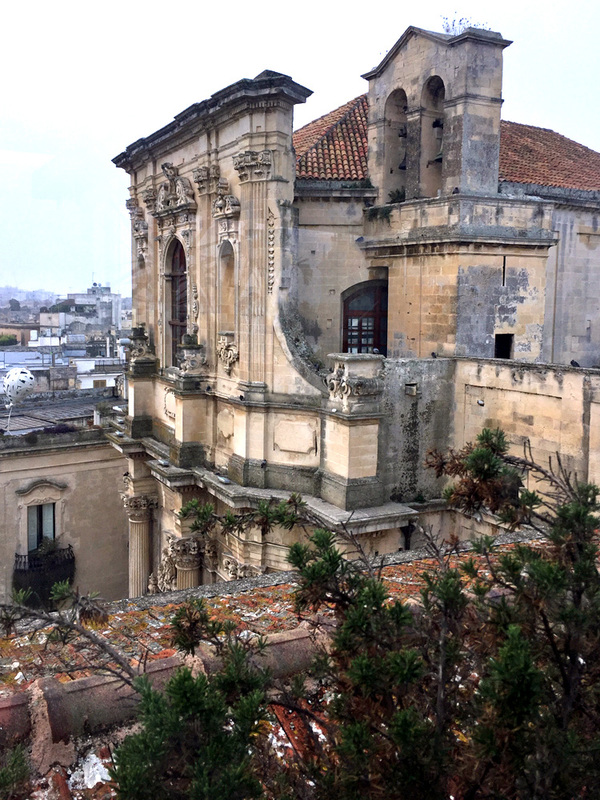 In fact, that’s the view from the breakfast terrace of the first hotel of my journey, Suite Hotel Santa Chiara in Lecce. I traveled through 4 regions of Italy during this time, visited 8 UNESCO world heritage sites (plus a few more that have been nominated), and ate and drank some of the best food and wine I’ve ever had in Italy. Because I have a lot to share, I’ll lay it all out for you in two blog posts for easier reference. 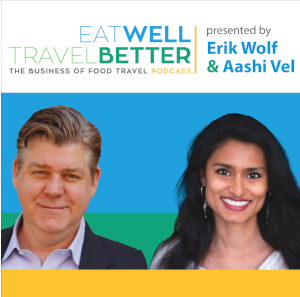 Part One covers the places we traveled to, and Part Two will cover the food, wine and olive oil of this region. Whether you enjoy the armchair travel experience, or are considering a trip like this yourself, I hope you enjoy the read and bookmark these posts for reference later. Note: Hyperlinks for towns will take you to the UNESCO website to learn more about those spots. 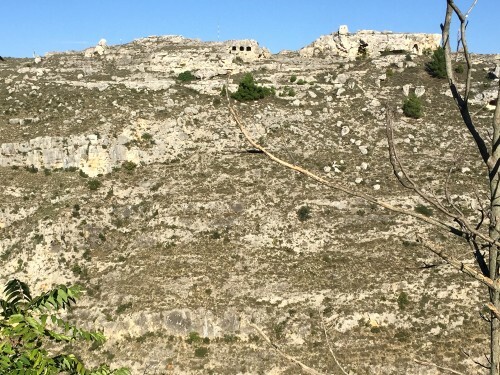 According to UNESCO, to be included on the World Heritage List, sites must be of outstanding universal value and meet at least one out of ten selection criteria. 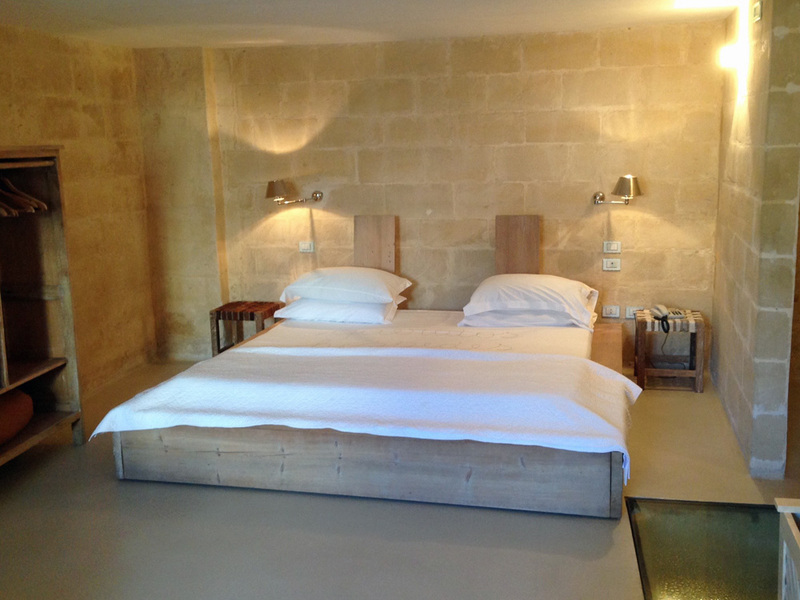 Hyperlinks for hotels will take you to the website for that hotel. 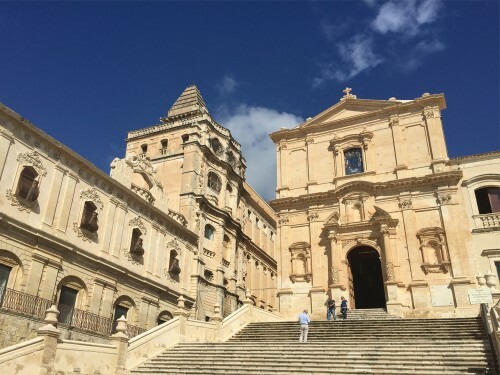 The term “southern” Italy generally refers to all of Italy from about Naples south, but in this post I’m talking about the “true” south – down in the heel, arch and toe of the mainland, and into the island of Sicily, covering the regions of Puglia, Basilicata, Calabria, and eastern Sicily. 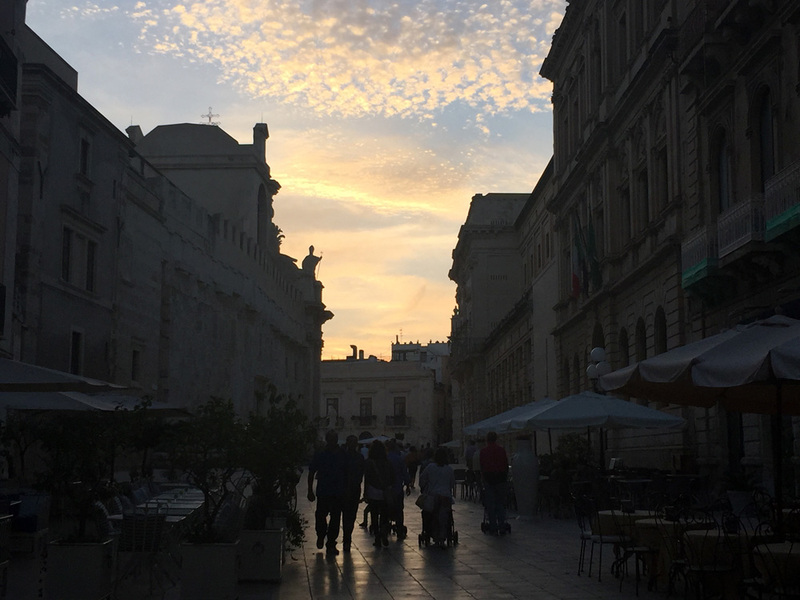 My journey began in Lecce, in the southern Salento peninsula of Puglia – what many refer to as the heel of the boot. I had just put my group of guests on the train to return to Rome, after hosting a group for a week long cooking school at The Awaiting Table, and I was setting out for the first time to explore southern Italy outside of Lecce. If you’ve never been to Lecce, you really should put it on your list. 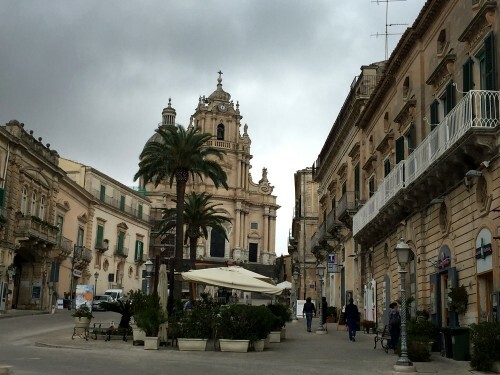 I won’t share much about it here because I’ve blogged about this town so many times already. 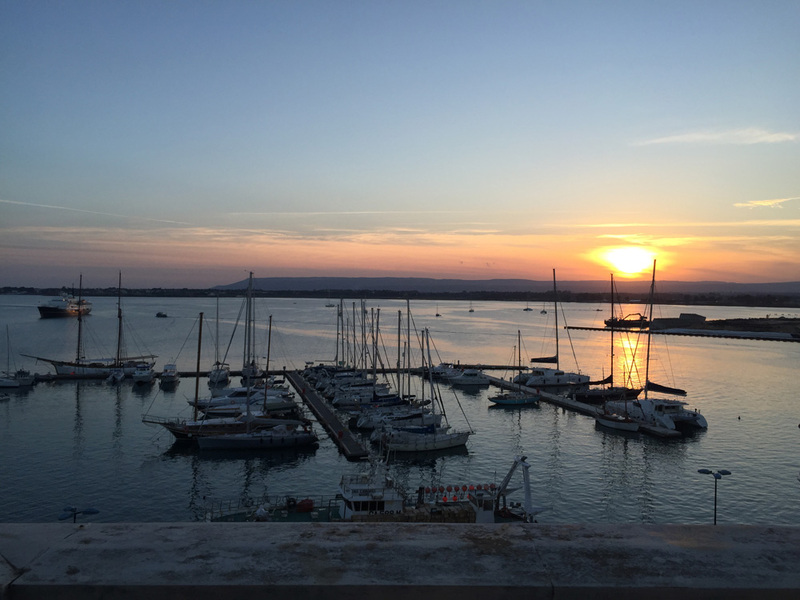 Other cities to see in Puglia include Otranto, and any of the laid back seaside resort towns. 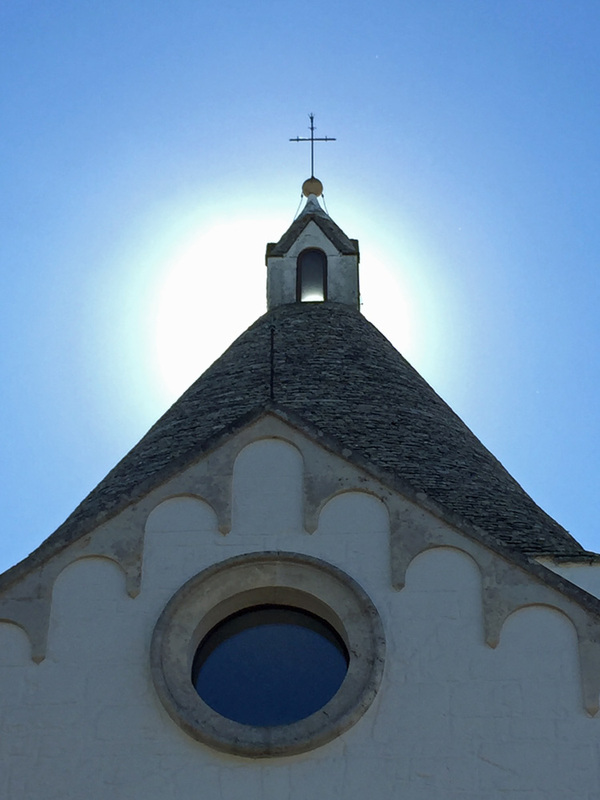 We drove through Alberobello in Puglia, on our way out of Puglia. 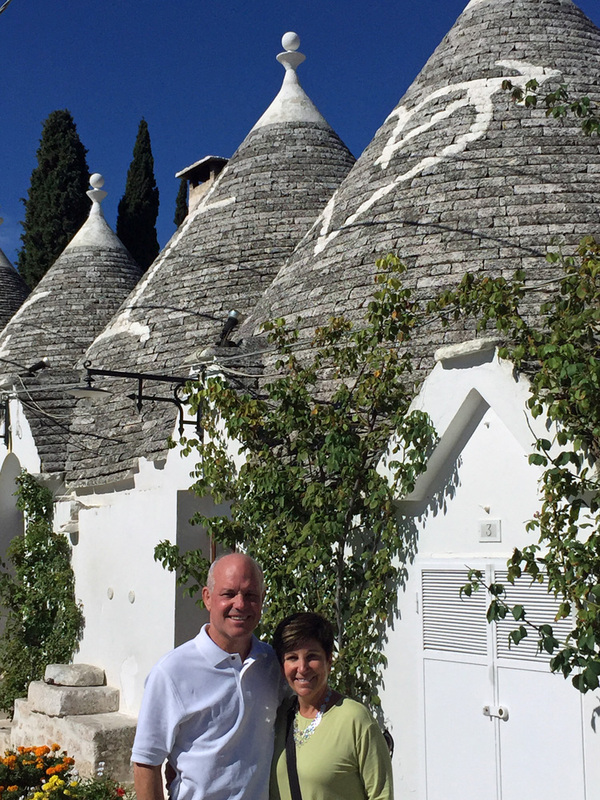 I wouldn’t recommend staying here, but it’s worth a stop in the town to see the trulli houses. These structures were made of dry stone in this conical fashion, as shelter or field houses. Today, people still live in and operate businesses from them. 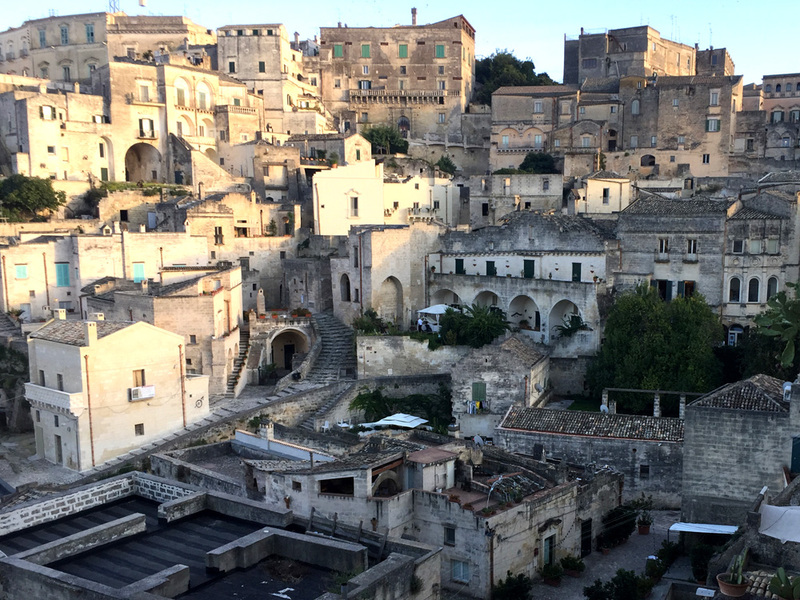 From Alberobello, we drove on to the Basilicata region, and stopped for the first night of our travels in Matera to break up the trip across southern Italy. Although I have tons of pictures, they honestly cannot even come close to capturing how incredible the old town (the Sassi) looks in person. 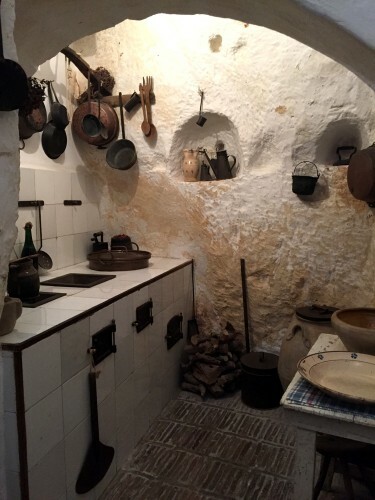 These cave dwellings are something you just have to see in person to appreciate. 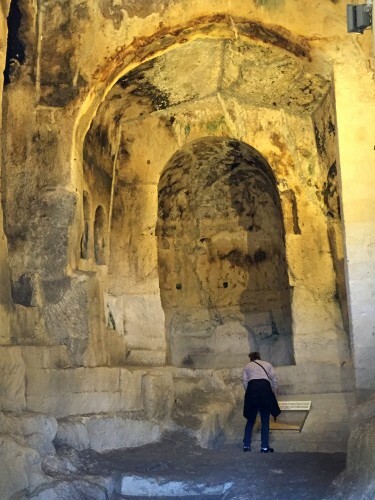 This is the oldest continuously inhabited place on earth, and the structures originate from the geology of the area. If you plan a visit, take some time to read about how civilization here into modern times, with thousands of landless peasants living in squalor and disease in these caves until the Italian government was shamed into taking action in the 1950s. Today the area is a tourist draw, with a thriving new city around the historic Sassi center. Our hotel was actually in what used to be a church carved out of a cave in the side of the mountain, with possibly one of the most unique hotel rooms we have ever stayed in (under that glass panel on the floor is more of the historic cave and our friends room actually included stairs down to a hot tub set below in the cave – romantic and creepy at the same time! This isn’t really much to actually do in the Sassi other than tour it, see what it was like to live in these caves, and visit the historic churches.The surrounding area offers great hiking if you have time and are inclined, and Matera has been named the 2019 European Capital of Culture, which has spurred renovation of the Matera Cathedral in preparation, I’m sure. 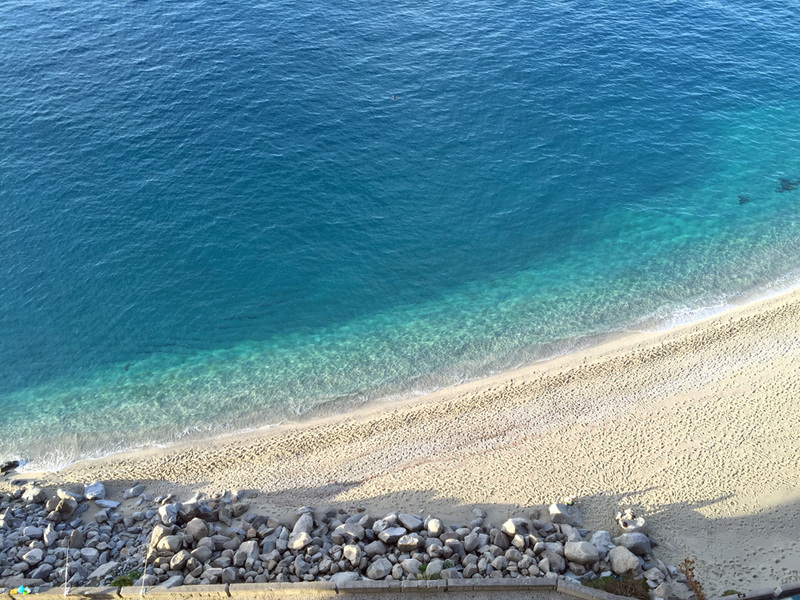 Our next stop was Tropea in Calabria, chosen to set ourselves up for being fairly close to catching the ferry to Sicily the next morning. The reason I’m not showing you photos of the town is that it wasn’t all that special. 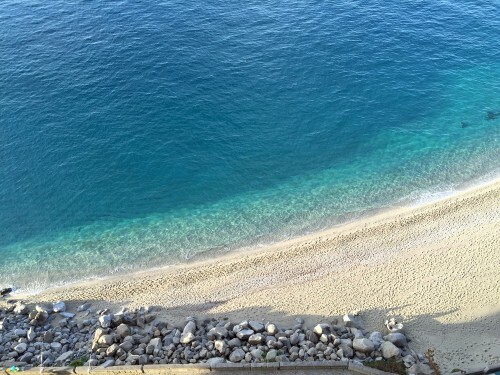 The real draw with Tropea – and what I read about before planning my trip – is the incredible beachfront around the town. Being mid-October, we didn’t partake, but it made for some pretty pictures. Tropes has a largely pedestrian only center with limitations on driving, which makes it hard to navigate for a short stop here. 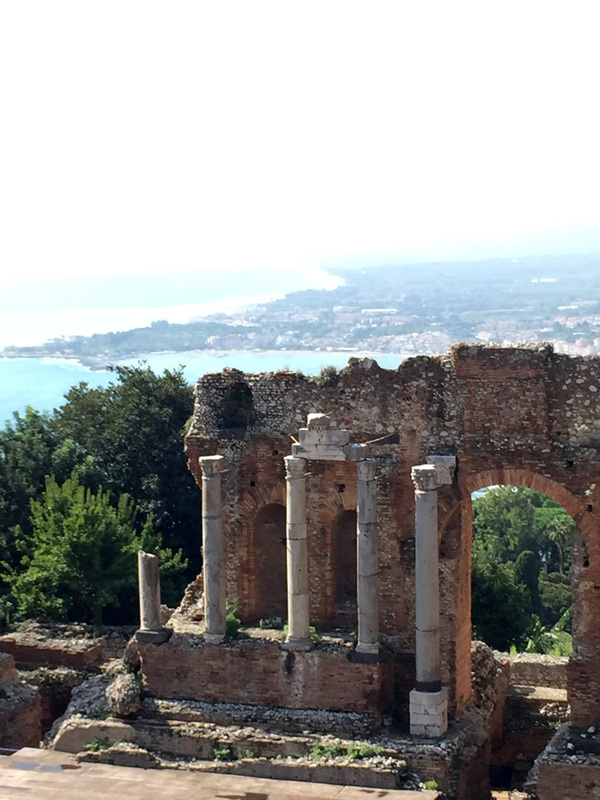 If you do plan to go, I would suggest opting for a prettier seaside resort, and visiting the historic center for the day, rather than trying to stay in the center like we did. 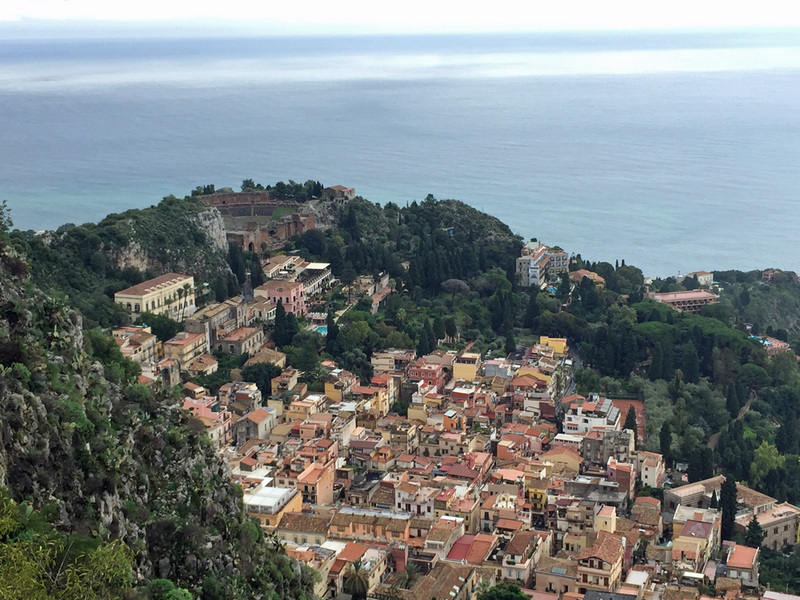 Traveling somewhere new is always a challenge, and driving through Italy is never easy. On the small side roads, cars pass in no passing zones on blind curves and it can be unnerving to say the least. The highways through much of Italy alternate between very dark tunnels (I was told there is no lighting because the copper had been stolen from them) and windy bridges. Italian drivers expect you to stay in the right lane unless you are passing, end then to do so quickly. 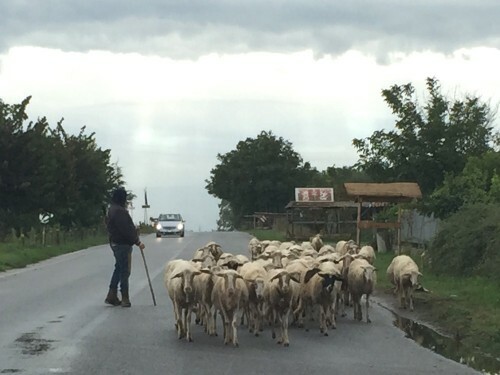 In our case, we also had some bad weather to drive through (although this herd of sheep brightened our moods!) on our way to the ferry. My advice is to be patient, stay alert, and just take your time getting to your destination. 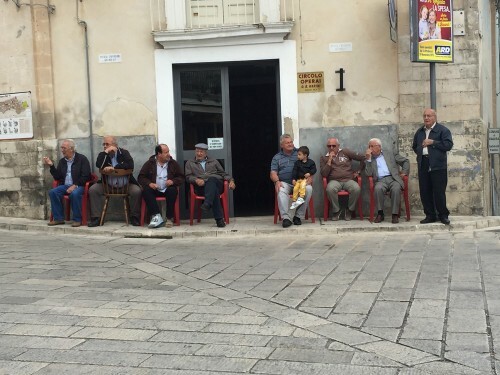 Note: if you are planning on taking the ferry from the mainland to Sicily, try emailing them right before your visit for the schedule. What was posted online was incorrect and we had to wait for over an hour at the ugly ferry terminal building in a torrential downpour before getting on the ferry for the one hour journey from Villa San Giovani to Messina. After driving about an hour south along the coast of Sicily from Messina, our first stop was in Taormina, on the northeast coast of the island. My friends in Italy advise against visiting here, because it’s filled with day trippers from cruise ships. Yes, it’s touristy, but there is a reason they all stop here. It’s beautiful, perched on the hillside with the second largest Greek amphitheater ruins (which were later remodeled by the Romans) in Sicily out on the point. The town is full of pretty buildings to photograph, cafes in which to enjoy a beverage, trattorias for lunch, and plenty of shopping. We found it quite enjoyable, even while jostling through the cruise ship tour groups with their matching caps and headsets on. We had arrived here exhausted – I had driven in the rain up the very winding hills outside of Tropea to get on the autostrada, then through those tunnels and over those bridges, sat in the rain at the ferry, rode the ferry through an all out lightening storm like I’ve never seen, continued driving through the dark tunnels on the northeast part of Sicily, and finally up the winding hills to the top of Toarmina to find our hotel. I was stressed, the rest of the group was more than a little carsick, and all we wanted was to get out of the car and relax. Well, you know a hotel experience is going to be special when, upon arrival, they tell you to just dump your car and they will take care of it and will put your bags in your room for you, and then ask if you’d like to just sit down and relax with a glass of prosecco on the patio. Um, yes please! Our hotel here was the most expensive of the trip, but so worth it – Villa Ducale, set high on the hill of town with this sort of breathtaking views of the coast and Mt. Etna. 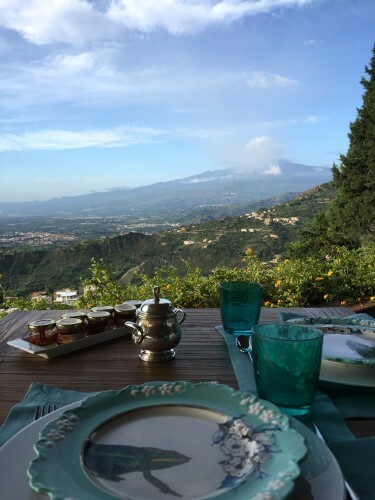 I also don’t know that I’ve ever enjoyed a breakfast view quite so much as this one. The hotel is just 50 feet away from the winding steps that go all the way down into town – something like 45 flights of stairs which I did once each day, but at least I felt like I burned off a little of that fabulous pasta and wine! After two days in Siracusa, we drove further south, stopping for a wine tasting on the way (details in the next post), and arrived in Siracusa late in the day. We stayed in the old city portion, on the island of Ortigia. 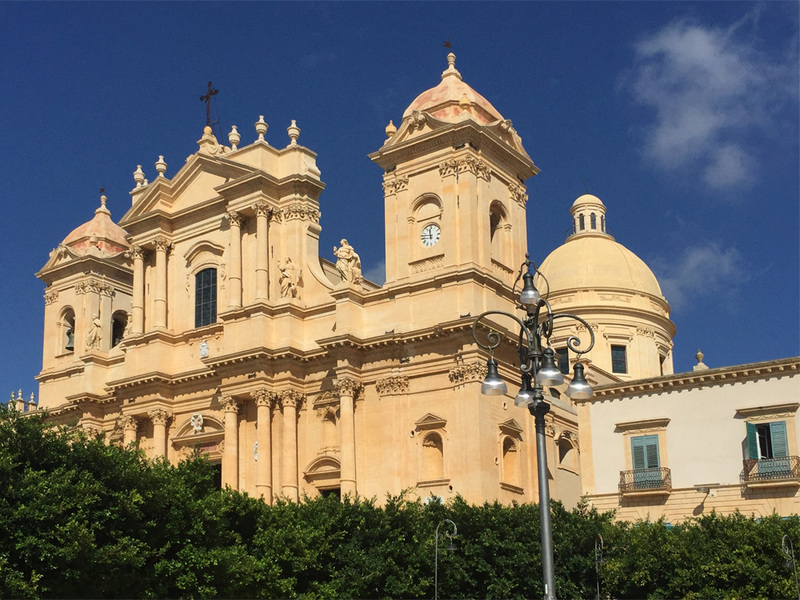 Ortigia is simply lovely, filled with gleaming white Baroque buildings like so much of southern Italy and Sicily, and boasting a lively, pretty, large central piazza. 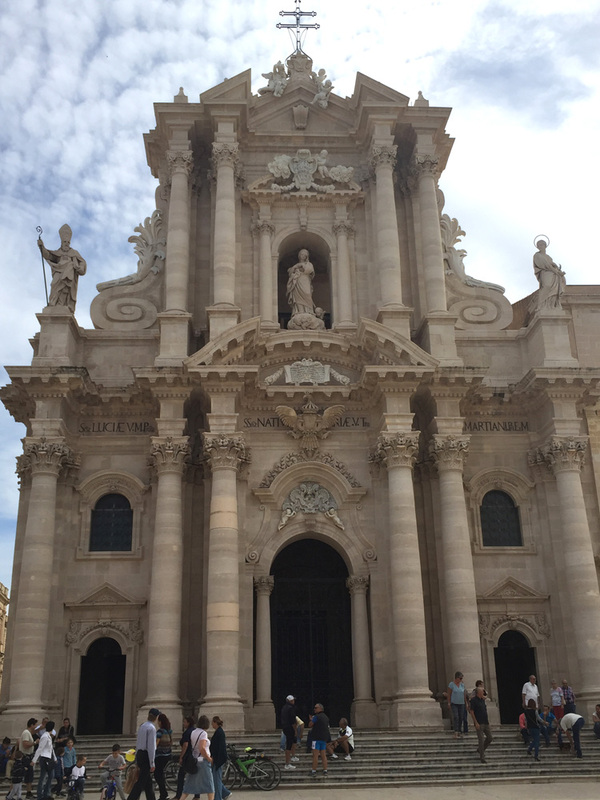 I kept marveling the entire time I was here at how clean and white everything in southern Italy is compared to Rome. I’m not sure if it’s the traffic and smog in Rome, or just that the stone used here is different, but it’s really pretty for sure. 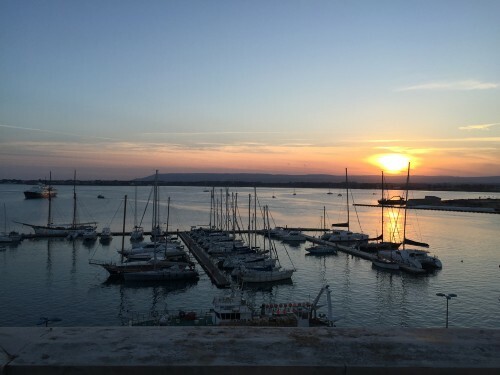 You’re at the southeast tip of Sicily when you get to Siracusa, and the sunsets are gorgeous, whether viewed over the water or reflecting back on the buildings of the city. I was pleased with our hotel choice here also – Grand Hotel Ortigia – set just at the edge of the pedestrian only portion of the old town (that arch in the photo above is where you walk into the old town), with a parking lot just across the street, making it easy to get in and out with a car (a huge relief after spending so much time in other locations trying to park). Cocktails and breakfast (along with meals, although I’d recommend going into the town to eat) are offered on the roof top patio, which is where I captured these photos. 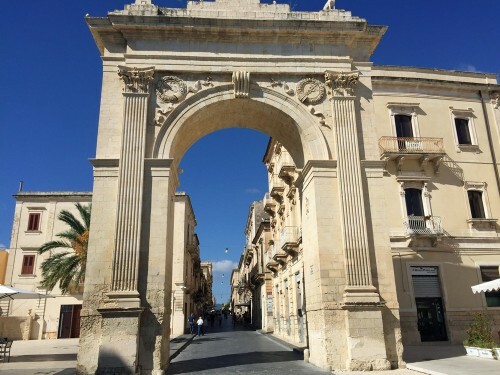 Ortigia is bustling with people, full of shops and restaurants, and is a perfect respite for a couple of days. We took a boat ride around the island which was a pleasant way to spend an hour. 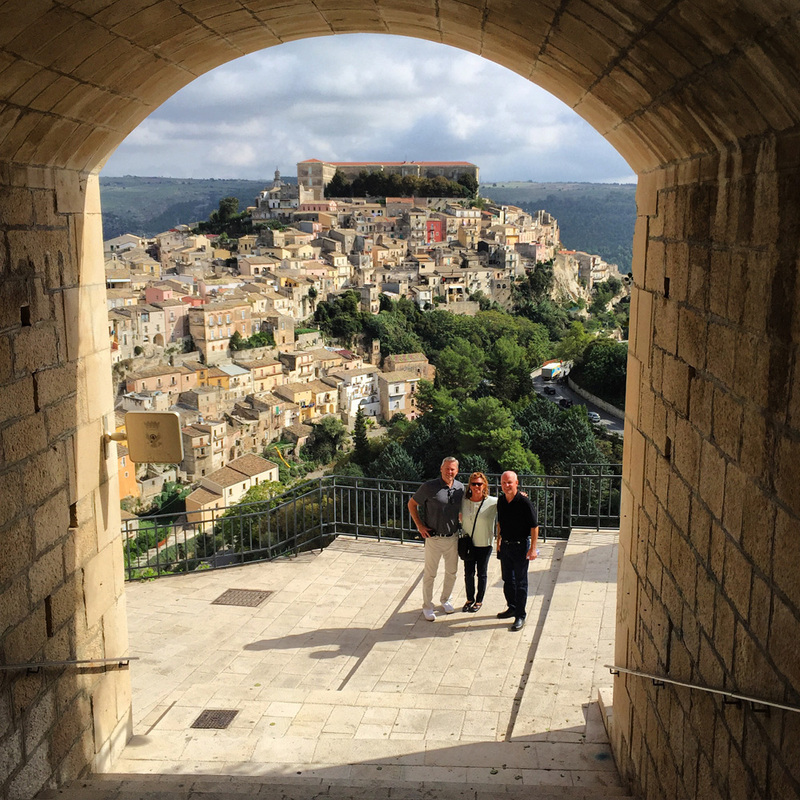 Hire a private guide like we did (not very expensive) and you’ll really enjoy the trip to the caves and seeing the city from the water – and don’t forget to take some Sicilian wine along for the trip! There is also a fortress to see at the tip of the island, but it turns out that is closed on certain days and we could only peek at it from the outside. 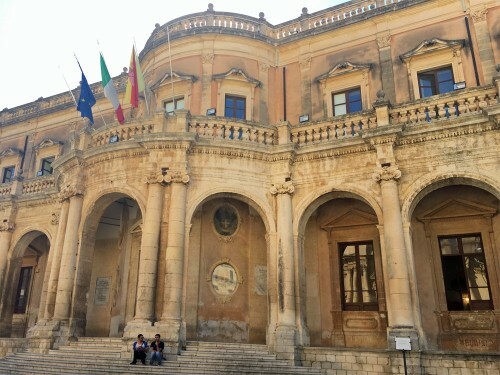 We left Siracusa to head for another wine tasting (details join the next post), and since it was right on our way, stopped in the town of Noto to walk through on our way. We were there just long enough to see how pretty it is and to grab a bottle of water and a coffee, but if we had had more time, I would have planned a day to explore this pretty little town. There are some great food producers in this region whose products are imported by a colleague of mine. Our destination for this day was actually Ragusa, which is divided into the older Ragusa Ibla (above), and the newer (but still old in our terms!) 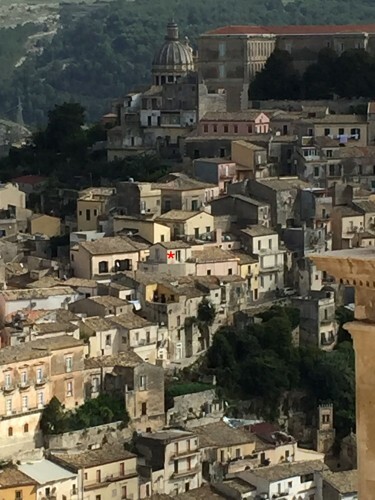 Ragusa Superiore. After the huge earthquake of 1693, they tried to get everyone to rebuild in the neatly planned new area of Ragusa Superiore, but many of the residents chose to rebuild in Ragusa Ibla. It wasn’t until 1926 that they were merged into one city to become the provincial capital of this region. You can just see the Duomo at the top of the hill, next to the large university building that used to be a fort. This may look large, but it’s really a tiny town that is easily navigated on foot. 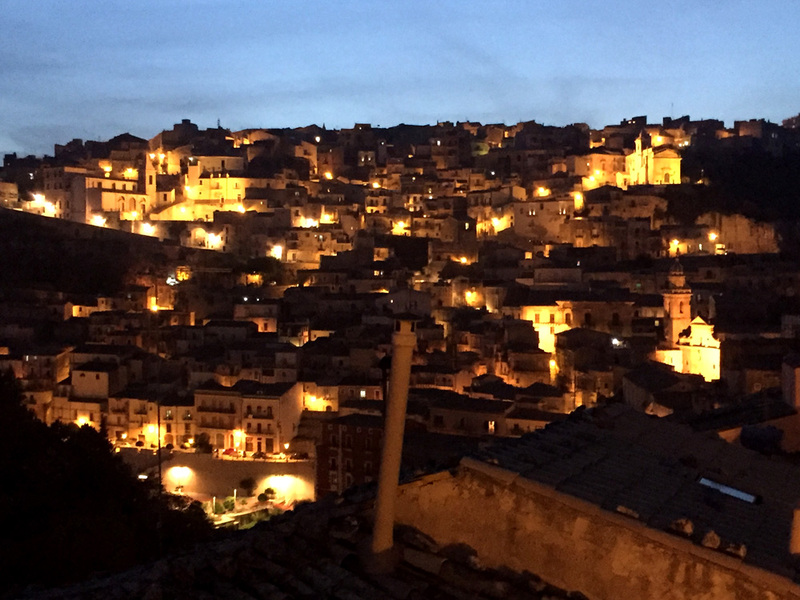 If you go, definitely stay in the older Ragusa Ibla area. 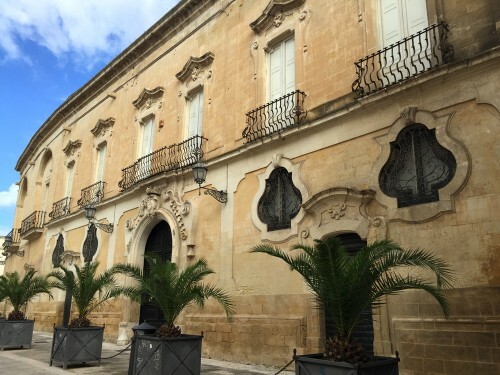 Our accommodations were at the Hotel Dell’Orologio, which is made up of something like 24 different spaces – half rooms in a central building, half apartments scattered in the area of Ragusa Ibla around the hotel. See that red dot in the photo? That’s our apartment… …complete with a wrap around deck with views of the sunset back over Ragusa Superiore. It was incredible sitting out here in the evening, sharing a bottle of wine with our friends, and soaking in the views. 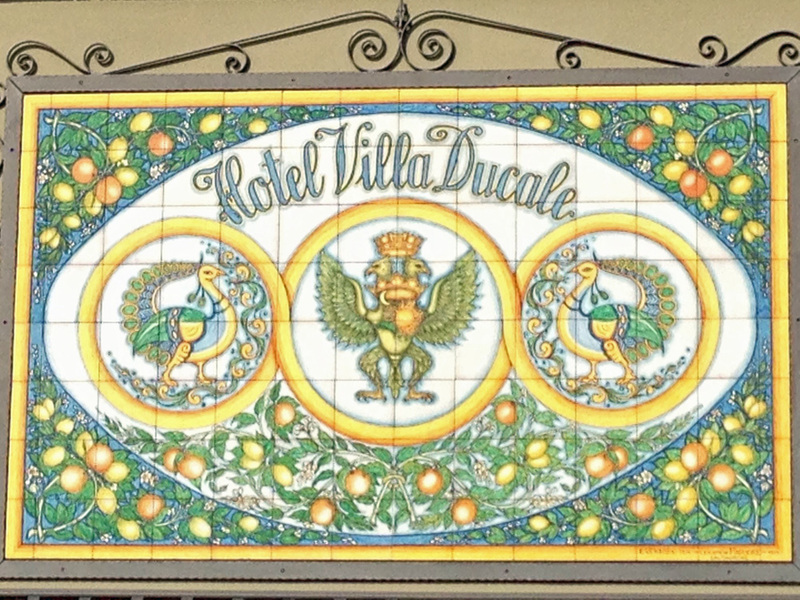 Note: this hotel is not easy to get to as it’s within the ZTL of the town (zone trafficato limitato). 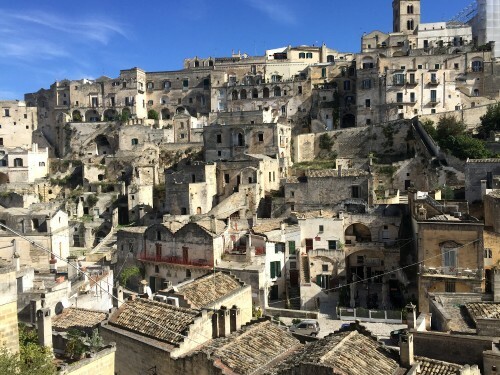 But the owner is a gem, and they will help you drive up to the hotel and unload, and then guide you back to the parking lot below the town to leave your car. They were even so kind as to load our bags into their car and take them down the parking lot for us when we departed so that we didn’t have to hassle with that. If you are going to arrive here with a car, email them ahead of time to make specific arrangements about where to meet with the car to get settled. 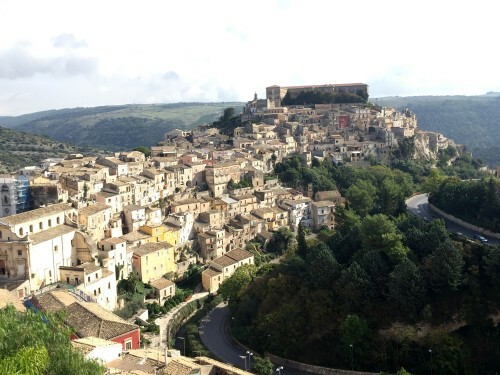 While you are here, be sure to hike your way across from Ragusa Ibla to Ragusa Superiore so that you can see the incredible views back onto Ragusa Ibla. Note: this hike is not for someone with health issues! My group has had knee and ankle surgeries, and it was pretty tough for us to manage. Take your time on the steps, wear comfortable shoes and bring water! 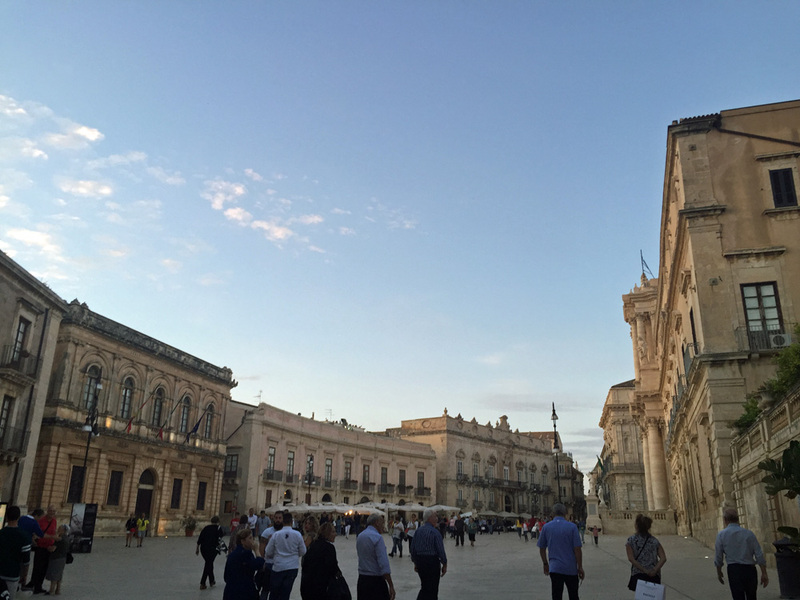 We didn’t find there was a ton to do in Ragusa itself, but the main piazza was pretty, the food exceptionally good, and the pace relaxing. And after doing that walk that included something like 60 flights of stairs, we were perfectly happy to sit in one of these spots and enjoy our lunch and wine. 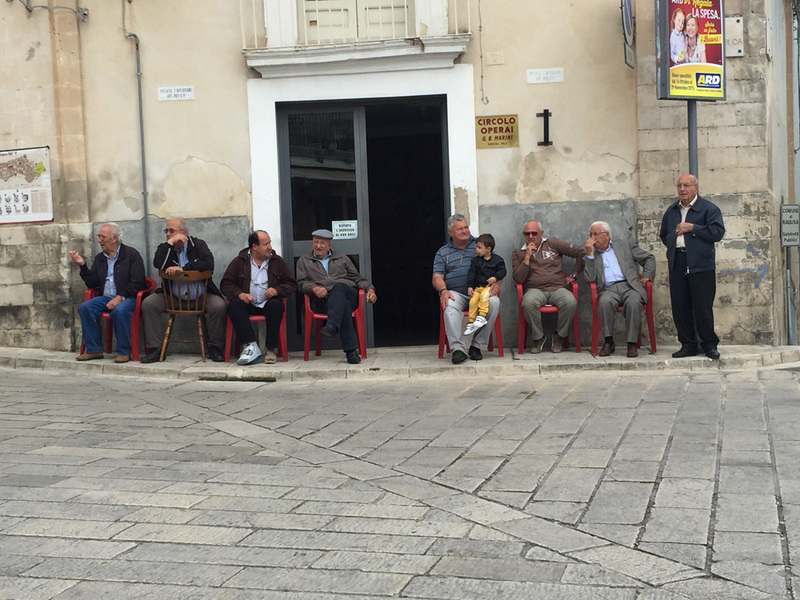 If you doubt my assessment about the pace in Ragusa, just look at this group – doesn’t this say it all? We ended our trip by heading into Catania for lunch in order to fly out that evening for Rome, spent the night at the hotel at the airport, and then flew home the next day. There are perhaps easier routes, but this worked for us and broke up the trip home a little bit. I’ll also put a plug in for Lufthansa’s new Premium Economy Class of service. It’s priced just slightly more like economy, but the seats and service are more like business class – we’ll be booking this again in the future for sure. 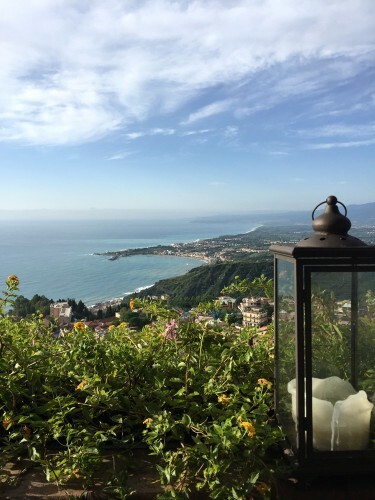 And I am also certain I will return to southern Italy and Sicily again – it’s magical! 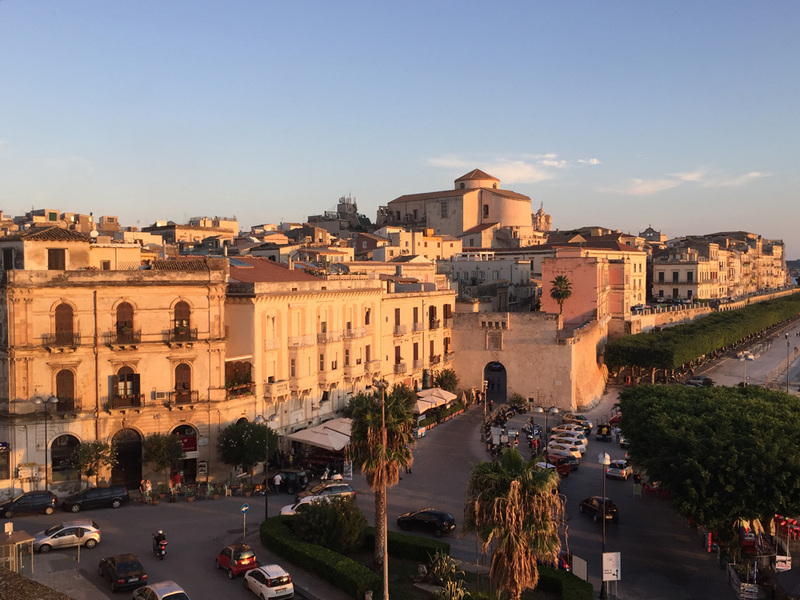 Stay tuned for Part Two in this series – all about the food and wine and olive oil of southern Italy and Sicily – coming up Monday!